* Artículo publicado originalmente en Rock Art Studies: News of the world IV. Editado por Paul Bahn, Natalie R. Franklin y Matthias Strecker. Oxbow Books, UK, 2012. En este se muestra un estado del arte de la investigación en arte rupestre en Colombia entre 2005 y 2010. 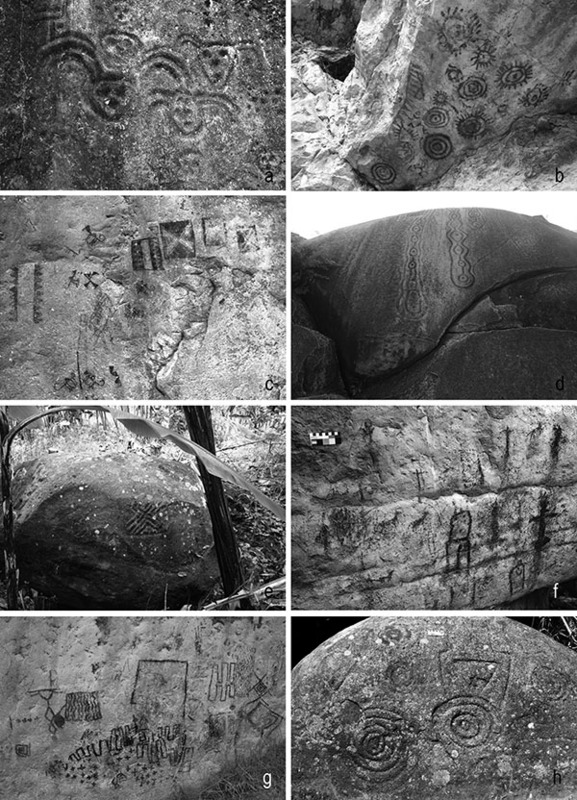 During the last few years a considerable amount of new information about prehistoric rock art has been collected and published in Colombia (Figs. 1 & 2). This information is extremely diverse as a consequence of the different objectives underlying rock art research, as well as the duration of such studies. But perhaps the factor that has generated most variation in the way rock art research has been carried out in Colombia is the wide range of theoretical perspectives, intimately related to the field of inquiry the researchers come from. These include: Anthropology (Pradilla & Ortiz 2002; Romero 2003; Flórez 2009), Archaeology (Hernández 1998; Castano & Van der Hammen 2006; Pino & Forero 2008; Alzate & Osorio 2009; Argüello 2009), Linguistics (Moreno 2009; Delgado & Mercado 2010), Archaeoastronomy (Quijano 2007), Mathematics (Quijano 2010), Mythology (Romero 2003), Iconography (López & Velásquez 2009; Martínez 2006, 2008b) Cultural Heritage (Botiva 2000; Martínez & Botiva 2004; Gómez and Barona 2007; Martínez 2008a, 2010a, 2010b), Conservation (Bateman & Martínez 2001; Álvarez & Martínez 2004). As a result, it is possible to find a broad variety of literature about rock art sites ranging from casual references to single sites – most of them consisting only of photos in archaeological reports (e.g. 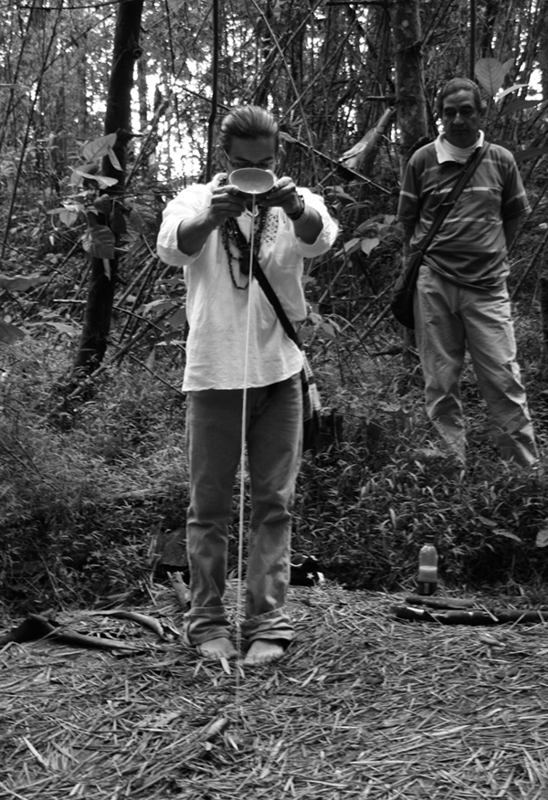 Mora 2003: 85) – to the extensive documentation of tens or hundreds of sites (Hernández 1998; Bonilla 2003; Restrepo 2003; Rodríguez & Pescador 2004; Martínez 2005a; Muñoz 2006; Martínez & Hernández 2006; Secretaría de Cultura de Norte de Santander 2007; Ramírez 2009; Navas & Angulo 2010; Pradilla & Villate 2010), either in sporadic newspaper articles or as part of cultural research management projects, unpublished theses, and scientific journals and books. Among the above-mentioned topics that have undergone some development in recent years in Colombia, three deserve closer examination, either because they are at the centre of current worldwide debates or because they are challenging matters that extend beyond the basic postulates of traditional rock art research. These topics are: the archaeological analysis of rock art; concerns relating to education, presentation and protection of rock art sites from a Cultural Heritage perspective; and the meaning of rock art sites. h. Chinchina (Caldas). Diego Martínez C., 2006-2010, Pedro Argüello, 2009. Fig. 2. Location of rock art sites documented and published during the last few years. Chronology is one of the most challenging topics in rock art research around the world (Whitley 2005). Although the dating of rock art is not a goal in itself, it is a fact that chronological accuracy is pivotal in order to understand the social context in which rock art was produced and used (Argüello 2008, 2009). In Colombia, almost all attempts to explain rock art have been made without a solid chronological basis. This lack of dating has not allowed the building of a credible explanation of rock art’s context. There is a general tendency to assign rock art to the Indian groups described by Spanish chronicles during the 16th century, without taking into consideration the fact that the places in which rock art exists were populated for at least 10,000 years (Correal & Van der Hammen 1977). Over such a long period of time diverse groups with political, economic and cultural differences settled here in succession. Contrary to the worldwide tendency for a growing number of archaeologists to be interested in the study of rock art, in Colombia the increasing number of archaeologists is inversely proportional to the number of them studying rock art (Jaramillo & Oyuela-Caycedo 1995). Although several archaeological publications contain information about this subject, in most cases rock art is not integrated with the problems treated by archaeologists in their analyses and just constitutes an addendum to the archaeological reports (i.e. Langebaek & Piazzini 2003: 70; Mora 2003: 85). Part of this situation has its origins in the incapacity of archaeologists to assign chronology to rock art, which prevents them linking it to other archaeological material. And to some extent it is the result of the Colombian academic tradition that has assigned a privileged role to other kinds of archaeological evidence (i.e. ceramics, lithics) as a source of information about the past. In recent years, two research projects have been carried out with the explicit aim of understanding rock art in an archaeological context (Castaño & Van der Hammen 2006; Argüello 2009). To determine what an archaeological perspective in rock art research implies is a difficult task because of the plurality and diversity of archaeological approaches (e.g. Chippindale & Taçon 1998). However, these two projects appeal to a traditional archaeological approach consisting of the recovery of archaeological material near rock art sites as a way to contextualise and date related activities. Although their results are preliminary and not necessarily conclusive, these projects have shown that, in fact, it is possible to recover the remains of activities that were possibly linked to the production and use of rock art, and they have opened the door to a promising perspective for an archaeological association of rock art. Although archaeological excavations close to rocks with paintings and petroglyphs are at present limited in number, they have demonstrated the diversity of contexts in which rock art was involved. 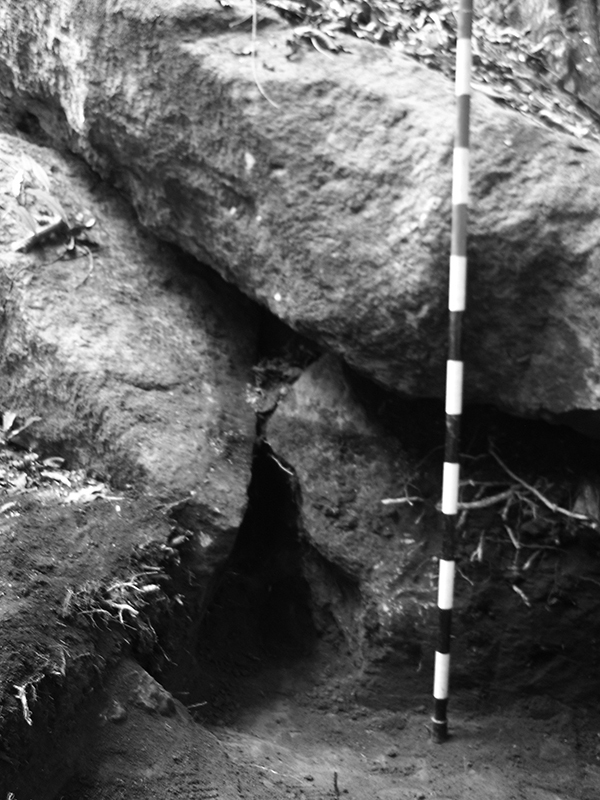 Excavations by Castaño & Van der Hammen (2006) of rock-shelters in Chiribiquete (southeastern rainforest region) suggest that such sites were constantly visited –but were not habitation sites– and ritual and ceremonial activities were probably carried out in immediate vicinity of panels with rock paintings. Such activities, according to the authors, would be related to “shamanic” activities. The “shaman”’s presence would be corroborated by the formal characteristics of the paintings – representation of phosphenes, “shamanic” animals, and ritual scenes (Fig. 3). On the other hand archaeological excavations in El Colegio (Cundinamarca) (Argüello 2009) seem to have found a different context in which rituals would be associated with domestic activities. Fig. 3. Transcription of a portion of rock paintings from the Abrigo de Los Jaguares (Chiribiquete). Drawing by Diego Martinez based on a photo by Carlos Castaño Uribe, 2005. Regarding the dating of rock art, Castaño & Van der Hammen (2006: 41) assert that the rock paintings of Chiribiquete were made between 450 and 1450 AD although some findings apparently suggest the existence of older rock paintings. This date is based on the presence of remains of pigments and fragments of rocks with paintings detached from rock-shelters and stratigraphically associated with charcoal and other archaeological artifacts. Unfortunately, no analysis of pigments from archaeological deposits and murals has been carried out in order to confirm that the pigments are in fact the remains of paintings. This means that definite confirmation of the age of the Chiribiquete rock paintings has to wait until a specialised pigment analysis has been done. Archaeological excavations at El Colegio (Fig. 4) have made possible the dating of activities associated with rock art use. Two kinds of activities seem to be related to the placing of offerings at the edges of rocks with petroglyphs. In fact, fragments of rocks with petroglyphs and cupules as well as cobbles have been excavated close to the main rocks (Argüello 2009). Other activities such as hearths have also been identified in the immediate vicinity of petroglyphs. Pottery sherds associated with these activities have been dated to between 2100 and 1100 BP, suggesting the period during which petroglyphs were probably used. were found. El Colegio (Cundinamarca). Pedro Argüello. In short, contrary to the belief that a traditional archaeological approach to rock art is futile, both the Chiribiquete and El Colegio cases have demonstrated how the responsible application of archaeological methods is a powerful tool for answering basic questions about the more complex problems that remain. Unless we decide to opt for the uncritical application of universal theories, we have to accept the necessity of building a solid basis for the comprehension of rock art, part of which is the uncertain chronology. Beyond academic concerns, perhaps one of the most important results of the above-mentioned archaeological projects is the re-evaluation of the definition of rock art site (Martínez, 2005b). It has been traditionally considered that the site is just the rock with paintings or petroglyphs; but now it is necessary to accept that the archaeological deposits around these rocks are part of it as well. Such a statement implies new considerations regarding the protection of rock art sites because it is a common practice to loot these sites in search of Indian treasures. Therefore, documentation projects should be accompanied by an educational campaign in order to avoid that new sites could be vandalized. According to the Colombian Political Constitution (1991), every archaeological object belongs to the State. Rock art is considered a constituent part of the National Archaeological Heritage and is dealt with by the Special Regime of Archaeological Heritage (art. 54 t.IV, Dec.763-2009) whose principal objectives are protection, recovery, conservation and presentation. This legal framework, developed during the last decade, has made possible some progress in the conservation of archaeological material, although a convincing State policy is still necessary. Although the law is mandatory about the obligation to carry out CRM archaeology in almost every civil project involving soil removal, the expansion of the urban frontier is still perilous for both rock art and its surrounding context, mainly because companies working in civil projects do not know the law or arbitrarily violate it. But even worse, many rock art sites are destroyed through lack of knowledge about the correct management of this cultural resource by archaeologists practising CRM. Concerns about the preservation of rock art have been a growing field of interest in recent years. The broad variety of issues that have been taken into account could be grouped into a number of different topics. 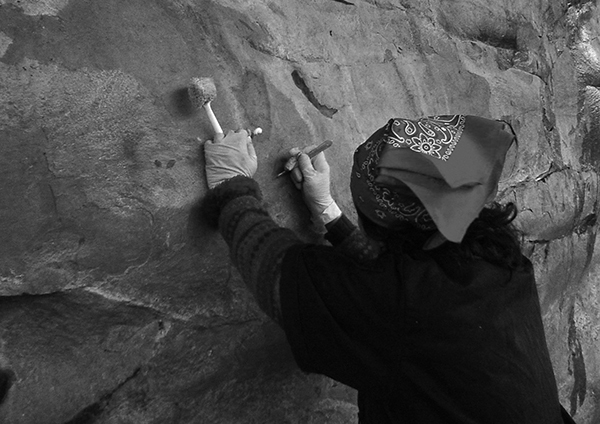 The most consistent effort has been focused on the presentation of rock art. Target groups have been diverse, although systematic processes have put an emphasis on local administrative authorities (Botiva 2000), schoolteachers and students (Martínez & Botiva 2004) as well as organised community groups (Fig. 5). The scope of these educational projects was initially limited to the centre of the country, and they were directed by the State agency responsible for protecting archaeological heritage (Instituto Colombiano de Antropología e Historia – ICANH) as part of an educational project directed by archaeologist Alvaro Botiva. Since then, some similar attempts have slowly been adopted in other regions (Gómez & Barona 2007). Although it is difficult to evaluate the real effect of such educational programmes, it is hopeful that some of the groups involved are using these materials as a “point of departure” for demanding that administrative authorities pay attention to rock art conservation, and as a source of knowledge about the topic. On the other hand, the growing visibility of rock art has led some of these embryonic groups to include it in projects of cultural and ecological tourism. However, this might turn into a double-edged weapon, because it could allow rock art to be protected by an informed community while exposing it to perils related to poorly informed tourists. Fig. 5. 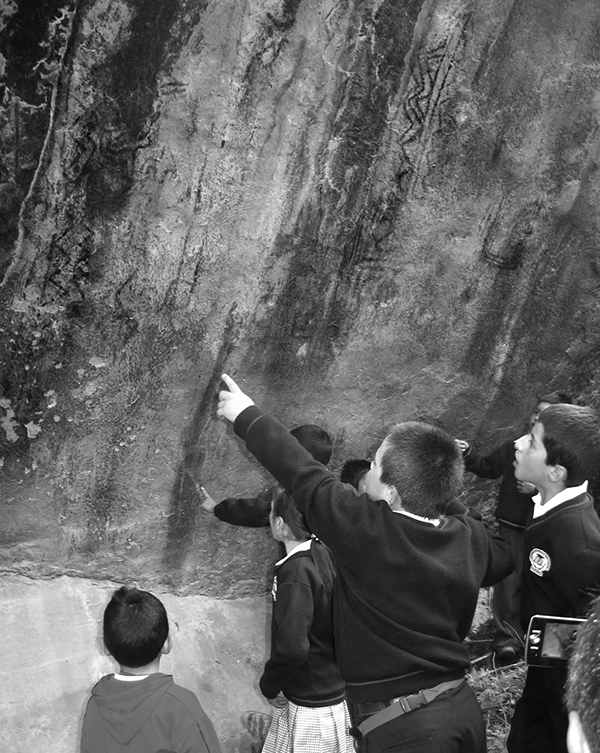 Schoolchildren participating in a rock art workshop. Zipacón (Cundinamarca). An experimental project of conservation was carried out in one of the best known but vandalised rock art sites (Fig. 6). 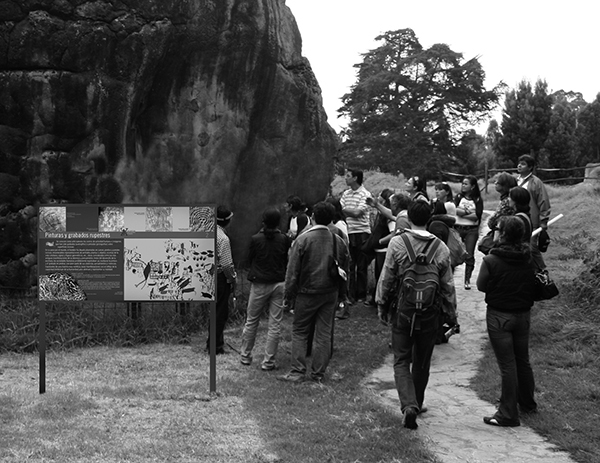 The Facatativá Archaeological Park (containing around 77 murals with rock paintings) is perhaps the best example of erroneous heritage management in Colombia, which has led to the significant deterioration and disappearance of rock paintings. In 2004-2006 a group of conservators successfully achieved the removal of graffiti and natural damaging agents which were covering rock paintings (Álvarez & Martínez 2004). This pioneer project demonstrated the potential for rock art conservation – a subject that has always caused controversy – as well as the necessity for integrating specialists from different fields of knowledge into rock art conservation. 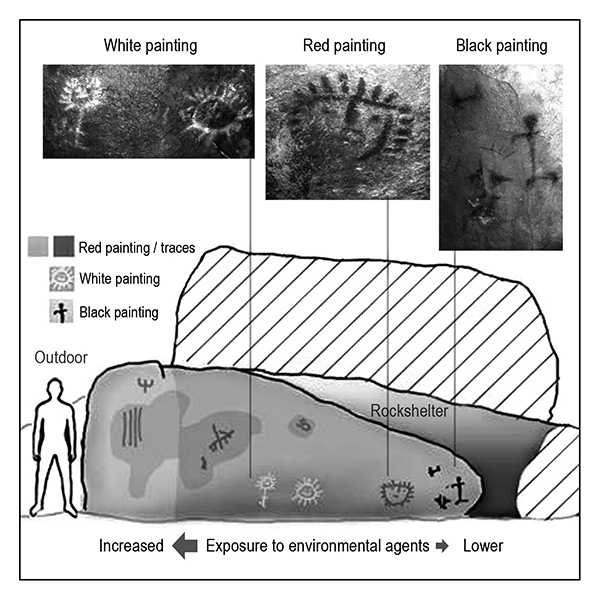 On the other hand, the experience of the conservation work on the Facatativá rock paintings was an opportunity for us to reconsider the social context in which rock art is involved, since the rock paintings were “re-vandalised” just a few days after the restoration took place (Argüello 2006). Fig. 6. Conservation work (graffiti removal) in Parque Arqueológico de Facatativa (Cundinamarca). We also have to consider the way people think about and relate themselves to material from prehispanic communities. Colombia is a country of diverse “ethnic” groups that have been differentially integrated (and sometimes just excluded) in a failed attempt at national construction. Some of these groups, frequently dubbed “ethnic minorities”, have a long history of struggle against central State administration in an effort to maintain their lands, autonomy and identity. An important component of these struggles consists of memory recovery and the construction of historical narratives, most of them strongly related to prehispanic material such as rock art (e.g. Dagua et al. 1998: 65-66). In consequence, different and sometimes conflicting “versions” about heritage ownership and management have emerged (Londoño 2003). In recent decades, an increasing number of groups claiming to be direct descendants of prehispanic communities or being part of movements whose aim is to revive ancestral forms of knowledge have proliferated in several regions of Colombia (Fig. 7). Some of these movements have made direct or indirect use of rock art. Indirect use refers to simple appropriation of iconography for a diverse set of activities, publications, publicity, and so on (e.g. Gutiérrez 1999). Direct use refers to claims for rock art as a source of knowledge about ancestors or even as a channel of communication with them (Correa 2002; Gómez 2009). With respect to the way in which rock art is involved in claims by new social movements, there are three topics that seem to be pre-eminent: concerns about the necessity of protecting rock art sites, new attempts to explain rock art meanings, and the use of rock art sites to perform different sorts of activities. The first two topics are very welcome in rock art research, but the third brings a series of necessary reflections. For example, Gómez (2009) relates the use of the rock paintings in the Archaeological Park of Facatativá by a “neo-Muisca” priest in order to communicate with Muisca deities and to be instructed by them. As a consequence, an increasing number of activities are taking place around rock art murals. 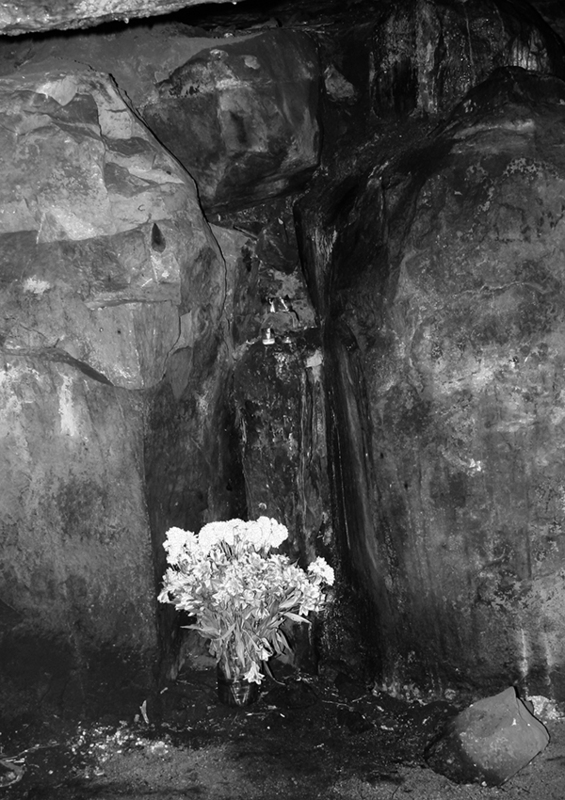 Some of them, like offerings and pledges, as far as we know, pose no threat to rock art, but others like incense burning may cause damage to rock paintings. In fact, recent inspections in the Archaeological Park of Facatativa have verified the existence of debris from ceremonial activities performed by different groups (Fig. 8) (Martínez 2010). in a rock-shelter in the Parque Arqueológico de Facatativa (Cundinamarca). Diego Martínez C. 2009. Performance of different kinds of activities around rock art sites brings up a diverse set of problems that can be summarised in one question: who has the right to decide about what can, or cannot, be done with rock art? Of course the position of academia is that rock art should not be touched under any circumstances, except when rock art specialists consider it necessary (Martínez & Botiva 2004). On the other hand “neo-Muiscas” would state that they are direct descendants of the people who made the rock art. They can also claim that the activities they perform are ordered by the gods to whom the rock art was dedicated. Since “neo-Muiscas” state that rock paintings are teachings, new priests might even decide to place their own images on the rock, or retouch prehispanic rock art in an attempt to make it visible. Until recent years it was assumed that Colombian rock art deserved only a marginal place in scholarly works which summarised knowledge about this topic in South America (Dubelaar 1984; Schobinger 1997). This situation was due to several factors such as the low flow of academic information between South American countries, but more especially to the lack of comprehensive studies about Colombian rock art that was almost limited to a few site descriptions. Luckily, this situation has changed considerably as a result of considerable efforts by a growing group of researchers interested in rock art studies. The use of new information technology has made the diffusion and circulation of information about rock art easier and cheaper. For instance, internet sites like Rupestreweb (www.rupestreweb.info) have effectively integrated scholars in Latin America and have become a tool for a very diverse audience. In addition, this tool allows some researchers to make their studies known to a wider audience (Fig. 9). Fig. 9. Interpretative pathway in the Parque Arqueológico de Facatativa (Cundinamarca). Script and design Martinez & Botiva, 2008. The increasing volume of available information about Colombian rock art has raised awareness of its diversity and complexity. More than just “discoveries”, each new site, or group of them, presents researchers with a new set of problems, and makes rock art explanation ever more challenging. Two examples illustrate this point. Recent discoveries of rock paintings in white and black in protected zones of rock-shelters have permitted researchers to postulate that the pre-eminent occurrence of red paintings in the centre of Colombia is a consequence of a taphonomic process (Argüello & Martínez 2004: Fig. 10) instead of a prehispanic cultural choice as was previously assumed (Cabrera 1969). The finding of rock paintings inside some caverns in western Colombia (Pino & Forero 2008), a region in which only petroglyphs in open-air sites had previously been found, demonstrates that the view of the preferential spatial distribution of different kinds of art is mostly related to the effect of the biased way in which rock art is sought. Sutatausa (Cundinamarca). After Argüello & Martínez 2004. While researchers are occupied by their goal of explaining rock art, they are also increasingly concerned with issues related to rock art conservation. Nowadays it is not possible to be involved in rock art research without facing problems associated with the survival of the object of study. But it is not only a question of the survival of the object itself; there are also the complex considerations such as nationalism, heritage, and the economic use of prehispanic material. In short, Colombian rock art research is both a challenging endeavour and a productive field for exploring and confronting current debates about this topic. We are grateful with Carlos Castaño Uribe and María Paula Álvarez for provide photos for Figures 4 and 6 respectively and James Williams for helping with English language in an early version of this text. Álvarez, M. & Martínez, D. 2004. Procesos de documentación y conservación en los conjuntos pictográficos 19 y 20, Parque arqueológico de Facatativá. Informe de investigación. ICANH: Bogotá. Alzate, N. & Osorio, C. 2009. Aproximación a una contextualización histórica y cultural de los petroglifos del Valle de Aburra. Tesis/Informe de práctica. Tesis (Antropologo). Universidad de Antioquia. Facultad de Ciencias Sociales y Humanas. Departamento de Antropologia: Medellín. Argüello, P. 2008. Tendencias recientes en la investigación del arte rupestre en Suramérica. Una síntesis crítica. Arqueología Suramericana 4 (1): 53-75. Argüello, P. 2009. 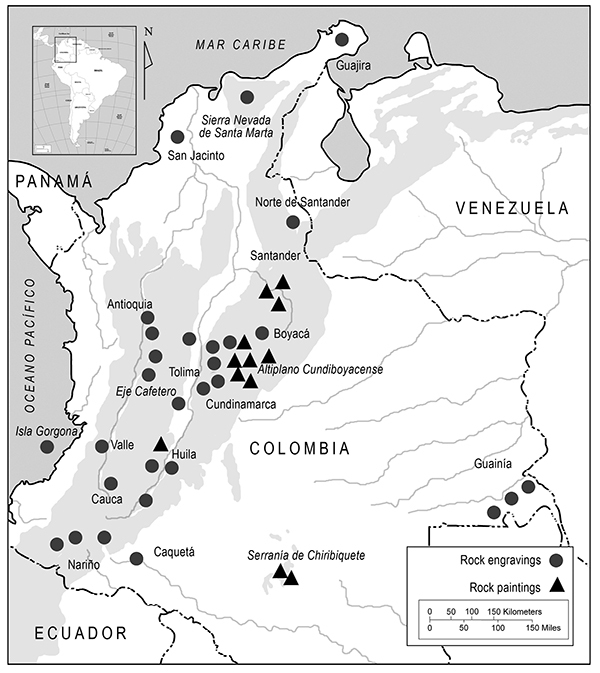 Archaeology of rock art: a preliminary report of archaeological excavations at rock art sites in Colombia. Rock Art Research 26 (2): 139-64. Bonilla, M. 2003. Programa de reconocimiento y prospección arqueológica para el E.I.A y P.M.A. del área de influencia del proyecto construcción y operación del propanoducto y planta almacenadora de gas licuado GLP Mondoñedo. (m.s). Velogas: Bogotá. Castaño-Uribe, C. & Van der Hammen, T. 2006. Arqueología de visiones y alucinaciones del Cosmos felino y chamanistico de Chiribiquete. Parques Nacionales Naturales de Colombia, Corpacor, Fundación Tropenbos: Bogotá. Chippindale, C. & Taçon, P. (eds) 1998. The Archaeology of Rock-Art.Cambridge University Press: Cambridge. Correa, J. 2002. Los muiscas del siglo XXI en Chía: el Resguardo Indígena de Fonquetá y Cerca de Piedra. Departamento de Cundimarca, Secretaría de Cultura: Alcaldía Popular de Chía. Correal, G. & Van der Hammen, T. 1977. Investigaciones arqueológicas en los abrigos rocosos del Tequendama (Vol. 1). Fondo de Promoción de la Cultura del Banco Popular: Bogotá. Dagua, A., Aranda, M. & Vasco, L. 1998. Guambianos: hijos del arcoiris y del agua. Fondo Promoción de la Cultura, Fundación Alejandro Angel Escobar, CEREC: Bogotá. Dubelaar, C. 1984. A study on South American and Antillean petroglyps.Royal Institute of Linguistics and Anthropology: New Jersey. Gómez, F. 2009. Los chyquys de la nación muisca chibcha: ritualidad, re-significación y memoria. Universidad de los Andes, Facultad de Ciencias Sociales-CESO, Departamento de Antropología: Bogotá. Gómez, T. & Barona, A. 2007. Cartilla Pedagógica de arte rupestre. Fundación Wayta Pachamama – Gobernación del Valle del Cauca: Cali. Hernández, D. 1998. Prospección Arqueológica y levantamiento de petroglifos en el Municipio de Itaguí. Tesis/Informe de Tesis (Antropólogo). Universidad de Antioquia. Facultad de Ciencias Sociales y Humanas. Departamento de Antropología: Medellín. Jaramillo, L. & Oyuela-Caycedo, A. 1995. 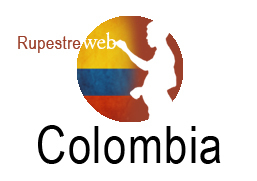 Colombia: a quantitative analysis, pp. 49-68 in (A. Oyuela-Caycedo, ed.) History of Latin American archaeology. Worldwide Archaeology Series 14, Avebury: Aldershot. Langebaek, C. & Piazzini, C. 2003. Procesos de poblamiento en Yacuanquer-Nariño: una investigación arqueológica sobre la microverticalidad en los andes colombianos (siglos X a XVIII d.C.). Interconexión Eléctrica S.A.: Bogotá. López, E. & Velázquez, A. 2009. Aproximación al estudio iconográfico de las manifestaciones rupestres en el municipio de Tamesis, Antioquia. Tesis/Informe de práctica. Tesis (Antropólogo). Universidad de Antioquia. Facultad de Ciencias Sociales y Humanas. Departamento de Antropologia: Medellín. Martínez, D. 2005b. Response to Munoz. The debate between GIPRI and ICANH-Double ethics in rock art research. Rock Art Research 22 (2): 202-03. Martínez, D. & Argüello, P. 2003. Documentación del yacimiento rupestre de Sáchica, Boyacá: informe final (m.s.) Calizas y Agregados Boyaca S.A.: Bogotá. Martínez, D. & Botiva, A. 2004. Manual de arte rupestre de Cundinamarca. ICANH – Gobernación de Cundinamarca, Segunda Edición. Bogotá. Martínez, L. & Hernández, H. 2006. Identificación y Caracterización del patrimonio Rupestre asociado a las áreas naturales de la jurisdicción de Corantioquia. (m.s. ), Corantioquia: Medellín. Mora, S. 2003. Early inhabitants of the Amazonian tropical rain forest: a study of humans and environmental dynamics. Department of Anthropology, University of Pittsburgh: Pittsburgh. Moreño, A. 2009. Pensamiento ancestral y petroglifos. Una aproximación semiótica al arte rupestre de Piragua –Cascajal en Timaná, Huila. Gobernación del Huila. Secretaría de Cultura y Turismo. Fondo de Autores Huilenses: Neiva. Muñoz, G. 2006. Patrimonio rupestre. Historia y hallazgos. Gobernación de Cundinamarca, Alcaldía Cívica de El Colegio: El Colegio. Navas, A. & Angulo, E. 2010. Los guanes y el arte rupestre xerirense: la revelación de lo desconocido y el redimensionamiento de lo antes firmado. Con la más completa muestra y análisis del Arte Rupestre Mesetario realizado hasta el momento. Fundación El Libro Total: Bucaramanga. Piazzini, C., Lozano, G. & López, L. 2002. Proyecto hidroeléctrico Miel I: programa de rescate arqueológico. Informe final (m.s.) Informe presentado al Instituto Colombiano de Antropología / Ejemplar 2 en Cd-Rom bajo CD-ARQ-1163. Isagen, Strata: Medellín. Pino, J. & Forero, J. 2008. Acercamiento arqueológico al estudio de las expresiones rupestres en un contexto de cavernas en el departamiento de Antioquia, Colombia. International Journal of South American Archaeology 2, February. Pradilla, H. & Ortiz, F. 2002. Rocas y petroglifos del Guainía. Escritura de los grupos arawak-maipure. Fundación Etnollano, Museo Arqueológico de Tunja, Universidad Pedagógica y Tecnológica de Colombia. Pradilla, H. & Villate, G. 2010. Pictografías, moyas y rocas del Farfacá. Museo Arqueológico de Tunja, Universidad Pedagógica y Tecnológica de Colombia, Gobernación de Boyacá. Quijano, A. 2007. El pictógrafo quillacinga de “El higuerón” como marcador del solsticio de verano. Empresa Editora de Nariño – EDINAR: San Juan de Pasto. Quijano, A. 2010. Estudio matemático del diseño Precolombino de la espiral en el arte rupestre des noroccidente del municipio de Pasto (Colombia). Rev. Acad. Colomb. Cienc. Xxxiv (no. 130): 53-70. Ramírez, G. 2009. Petroglifos en el paisaje o paisaje en los petroglifos. Propuesta para analizar la apropiación cultural del paisaje desde el arte rupestre en la vertiente occidental de Cundinamarca. Restrepo, C. 2003. Proyecto de desarrollo vial doble calzada Armenia-Pereira-Manizales, - Autopista del Café. (m.s.) Autopista del Café, Instituto Nacional de Vías: Pereira. Romero, M. 2003. Malikai, el canto del malirri. Formas narrativas de un mito amazónico. Fundación Parature: Cerec. Rodríguez, E. & Pescador, L. 2004. Manifestaciones de arte rupestre en la vereda El Fute, municipio de Bojacá: reconocimiento y prospección arqueológica en el relleno Sanitario nuevo Mondoñedo. (m.s) CISAN: Bogotá. Secretaria de Cultura de Norte de Santander 2007. Inventario arqueológico, paleontológico y de arte rupestre de Norte de Santander, Colombia. Informe presentado al Instituto Colombiano de Antropología e Historia, ICANH. Instituto de Cultura y Turismo: Pamplona. Schobinger, J. 1997. Arte prehistórico de América. Consejo Nacional para la Cultura y las Artes-Jaca Books: México. Whitley, D. 2005. Introduction to Rock Art Research. Left Coast Press: Walnut Creek.